A retired key Navy admiral says Adm. William J. Fallon will show that a naval officer is qualified to run ground wars in Iraq and Afghanistan. Retired Adm. Thomas Fargo, who was succeeded by Fallon when he retired as commander of U.S. forces in the Pacific and Asia two years ago, told reporters yesterday: "We train our flag and general officers to be joint officers and to understand the full range of capabilities of our military. I don't think that should be an issue at all. "Bill Fallon has a a wealth of joint experience. He has spent a great deal of time with the Army and Marine Corps. He's been to Iraq, Korea and other theaters. He's got all the skills necessary to lead the Central Command," Fargo said. Fallon, 62, appears to be President Bush's choice to replace retiring Army Gen. John Abizaid to head the Central Command, the New York Times reported last night. It said Bush is expected to announce the nomination next week before he gives his speech announcing a new strategy for the Iraq war. There were no indications of who would replace Fallon as the 21st commander of U.S. forces in the Pacific. In addition to the promotion of Fallon, the newspaper said Lt. Gen. David H. Petraeus will replace Gen. George W. Casey Jr. as the top American military commander in Iraq. The possibility that Fallon might leave his Pacific Command post at Camp Smith was circulating yesterday at the Coral Ballroom at the Hilton Hawaiian Village, where the Chamber of Commerce of Honolulu was holding its annual briefings by senior military leaders in Hawaii. However, Fallon was not present to tell local business leaders and island politicians where the Pacific Command is headed, as he has done in years past. His aides said he was in Washington, D.C.
U.S. Sen. Daniel Inouye said he hated to see Fallon leave Hawaii, saying that the defense secretary had been trying to get in touch with him over the past few days, but that he had been bedridden since Dec. 27 with a bad cold. "It's surprising news to me," Inouye told reporters. "This recommendation demonstrates that the president wants someone with a world or international view, not just a commander. "I think it demonstrates Adm. Fallon is the man they need." The Hawaii Democrat said, "He will be one of the few flag officers who we look upon as international in stature and understanding." Retired Adm. Ronald Zlatoper, who headed the Pacific Fleet in 1994-96, described the rumored appointment as "a wonderful choice for any command that the Navy has, and I am sorry to see him leave the Pacific Command. "He has every skill set you want in a leader, operational and intellectual." 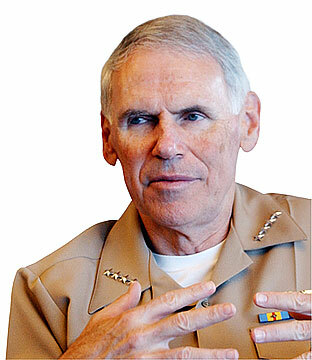 Fallon served as vice chief of naval operations from 2000 to 2003 and led the Navy's Fleet Forces Command in Norfolk, Va., from 2003 to 2005. The New York Times said Fallon is regarded within the military as one of its stronger regional combat commanders, and his possible appointment also reflects a greater emphasis on countering Iranian power, a mission that relies heavily on naval forces and combat air power to project American influence in the Persian Gulf. Military officers and Pentagon officials said Fallon would represent a shift in focus for the Central Command, as he would bring expertise in maritime security operations more than land operations. As the Iraq security operation matures, the focus for Central Command is expected to shift toward countering the threat from Iran. In that capacity, the military's role focuses on maintaining a regional presence through naval forces and combat aircraft, and conducting maritime security operations like interdiction of vessels believed to be carrying banned weapons materials or suspected terrorists, in addition to preparing for combat contingencies. Abizaid assumed the command of U.S. Central Command on July 7, 2003. He oversees U.S. military action in Iraq and Afghanistan, as well as U.S. security interests in 27 nations stretching from the Horn of Africa through the Arabian Gulf region, into Central Asia. Fallon was not President Bush's original choice to replace Fargo. Air Force Gen. Gregory Martin was forced to withdraw his nomination after a Senate confirmation hearing in which Sen. John McCain, R-Ariz., sharply criticized Martin's close professional ties to a top Air Force official embroiled in a procurement scandal.